ALBANY — It started with a corpse. Pastor Donald Stuart points to where police found the 82-year-old victim: a basement apartment with a cold brick entranceway. Here in this Clinton Avenue brownstone a man once branded “the slumlord minister” — a clergyman-landlord named Daniel Potter — was bludgeoned to death after what police claimed was a dispute with a tenant. And here, nearly 10 years later, Stuart starts the story of how his small church is returning a measure of decent housing to a street pockmarked by boarded-up homes. More: Stuart’s New Covenant Christian Fellowship has amassed 18 buildings and lots in Arbor Hill and West Hill. It acquired four homes from Potter’s widow, including the first of a cluster that church volunteers are refitting with ceramic tiles and fresh pine in their drive to build high-quality housing for low-income tenants. Church-developed housing is nothing new. What’s remarkable about New Covenant is how a church that didn’t exist 15 years ago has expanded so fast. And how it’s done so with the donations and sweat of members, most of whom don’t live around the church. New Covenant’s low-profile, small-scale approach contrasts with other sweeping schemes that have suffered problems or collapsed in the past. Think of the Urban League’s $40 million plan to revitalize Arbor Hill. These properties aren’t on the “new” Clinton Avenue. Follow the road downhill toward the Hudson River and it spills into a government and entertainment district of gleaming brick-and-glass buildings. The new Palace Theatre marquee flashes ads. Geranium-filled baskets decorate the street. Drive away from the river and the sense of investment fades. Yes, there are well-tended brownstones with neat gardens. But there’s also a street sign missing the “k” in Lark. Choppy pavement rumbles under your car. A toilet bowl sits in one front yard. This is the street New Covenant wants to rebuild. It’s a tiny piece of the city’s blight. Albany has about 22,000 houses. Some 800 to 1,000 buildings sit empty, many hoarded by owners hoping to flip them. 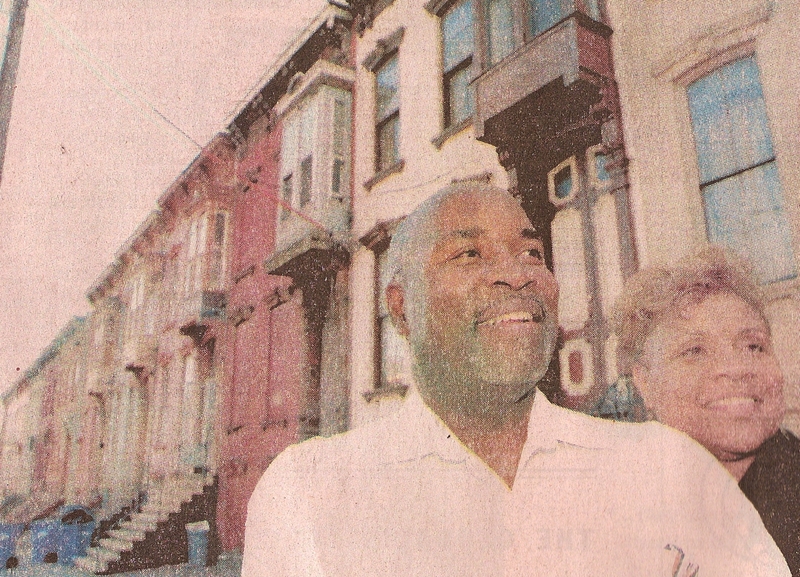 United Tenants of Albany Co-Director Roger Markovics confronted Potter in the 1970s over the landlord’s property management. He admires the church that’s taken over some of Potter’s homes for the quality of its work. Pastor Stuart, who has a fatherly presence that both puts you at ease and makes you want to sit up straight, traces New Covenant’s birth in part to his old commute from Latham to his Albany job as an administrator with the Department of Veterans Affairs. Every day he confronted a familiar sight: men hanging out on the street. Their hopeless expressions grated on him. He and his wife, Rose, approached the pastors at Harvest Church, where they worshipped then, about starting a ministry. Harvest gave them blessings, $1,000, and a copy machine. So began a struggle against what Donald Stuart vaguely labels “the forces you’re coming up against,” a phrase that might apply to drug dealers or chopped-up houses where tenants use ovens for heat. “You just refuse to surrender,” says Stuart, 61, who co-pastors the church with Rose. If the Stuarts need motivation to fight on, they don’t have to look further than the church office. It’s Monday afternoon, and Kelly Bunkley takes her seat at the computer. Soon, a deacon will bound up the steps and exchange his laptop for a weed wacker. Other volunteers will show up from work. But now the church is quiet. It’s been six years since Bunkley first came here. She takes a deep breath and talks about why. The story starts on Madison Avenue, in an abandoned car in the Price Chopper lot. This was her home. She scrounged for food, even ketchup packets. She did. And after the service, the deacon offered a ride home. Embarrassed, she said no. Then he asked where she lived. She didn’t want to lie, so she told him. New Covenant gave her an apartment at 367 Clinton. It had a big kitchen and easy bus access. She paid no rent until finding work. Bunkley is in her late 20s now. She’s moved on to her own place. But she still gives the church 20, 30, even 40 hours a week. She tithes 10 percent of her income. If I can give my all to my secular job, she reasons, how could I give the church less? Like Bunkley and many other church members, Clark also tithes. She’s considering an even bigger step: moving to Clinton Avenue. She wouldn’t be the first to take the church’s commitment to the block beyond the rental housing. Donald and Rose Stuart’s son bought a property on the street. So did their daughter. Early on, the daughter would be woken up by people ringing the bell looking for drugs. “A lot of people don’t want to walk past the church building cursing and swearing and drinking, knowing what we do for this community,” Bunkley says. The other day, the Stuarts won another victory on the street. A young man tossed a wrapper in a bin. He was so surprised by the Stuarts’ reaction, he looked at them like they had two heads. Thank you, they said. Thank you so much.